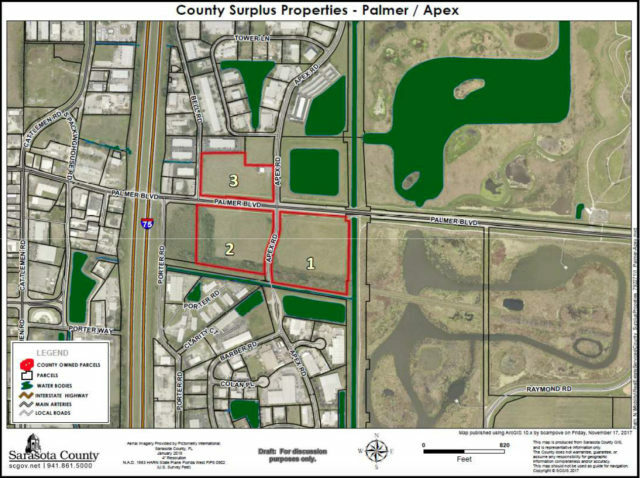 Sarasota County Commissioner Paul Caragiulo won the unanimous support of his fellow board members this week to direct staff to begin analyzing the potential rezoning of a county-owned parcel near the Celery Fields as part of the Fruitville Critical Area Plan (CAP). 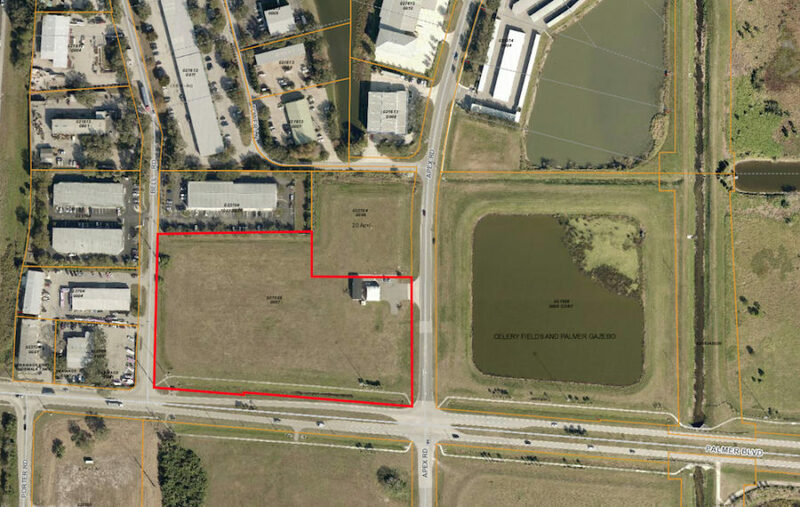 The vote followed commissioners’ expressions of conflicting viewpoints on the best use of what is known as the Northwest Quad, one of four parcels remaining from the creation of the Celery Fields stormwater project. A Miami consultant hired by the county to analyze the property said the “highest and best use” — a technical term regarding the greatest financial return to the county — would be as the site of 75,000- to 80,000-square-foot industrial facility. The firm estimated proceeds of $1.3 million to the county in the event the land were rezoned and sold for such a purpose. However, in response to a question from Caragiulo, Eric Liff, a principal of Lambert Advisory, conceded that the firm did not take into consideration the constraints of the road network in the vicinity of the property. “Did that come into play at all when you came down to the valuation?” Caragiulo asked. “We’re assuming that through the development process, there are ways to mitigate [the traffic problems],” Liff replied. “In this case,” Caraguilo said, referring to the area of Palmer Boulevard and Apex Road, “just about anything [except] a lemonade stand not seating more than five people” will lead to more traffic problems. “That road can’t be widened,” Commissioner Charles Hines noted of Palmer Boulevard. Chair Nancy Detert and Hines both talked about the potential of workforce housing on the Northwest Quad, while Commissioner Alan Maio pointed out that leaders of the Economic Development Corp. of Sarasota County have bemoaned the scarcity of property zoned for Industrial, Light & Warehousing (ILW) uses. “I would not like to see any outdoor facilities that would result in pollution, such as concrete things flying around in the air,” Detert said of the Northwest Quad. “Metal recycling would not be good. … I would really prefer a recreational use, if possible.” However, she added that she would be agreeable to a warehouse with all uses contained inside that structure. As Commissioner Michael Moran pointed out, many years ago, when the county was preparing to undertake the stormwater project that became the internationally renowned bird-watching area called the Celery Fields, the owner of the land insisted the county purchase the four adjacent “Quads” parcels. Moran noted that the county’s intent always was to sell the Quads. Later, as Maio also pointed out, the Northeast Quad was devoted to construction of a retention pond that would make the other three parcels open for development without stormwater concerns, thus increasing their value. “I don’t think there’s a reason to not use [the Northwest Quad] for something,” Maio added. Hines talked of his desire to sell the land because of the need to start building back up the board’s Economic Uncertainty Reserve Fund. Another recession will come, Hines pointed out, and the county is running out of the “rainy day” reserve that previous commissions set aside before the Great Recession. Maio concurred with the need for the funds the sale of the Northwest Quad would bring. He indicated that comments he has made while campaigning for re-election have been misconstrued. The board approved balanced budgets for the 2018 and 2019 fiscal years, he said, without tax increases. Nonetheless, staff had put hundreds of hours into developing a surplus property list, because the county does need the revenue, he added. 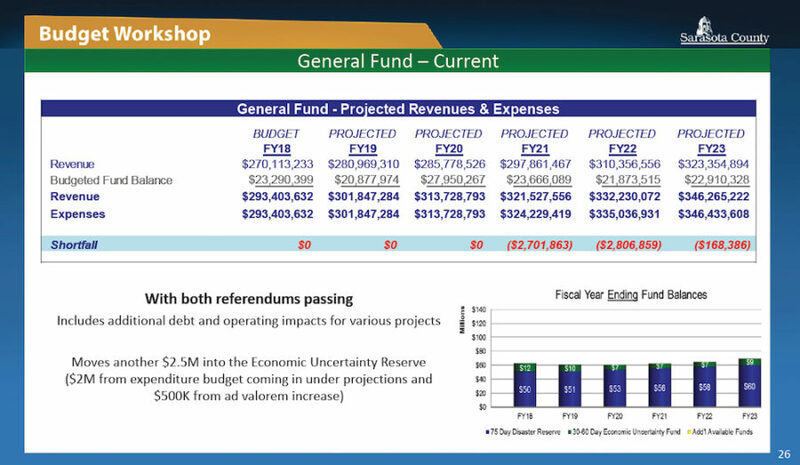 Future fiscal year models show the county with budget gaps starting again in 2021. “We’ve been very lucky with property value increases [the past few years],” Hines said. After Caragiulo made his motion, Matt Osterhoudt, director of the county’s Planning and Development Services Department, explained that the first step would be for staff to come back to the board with a proposal for the scope of work for inclusion of the property in the Fruitville CAP. Commissioners emphasized that staff should not feel rushed to accomplish that. Maio suggested early January for the staff presentation. “Understood,” Osterhoudt replied. In response to a Sarasota News Leader question, county Media Relations Officer Brianne Grant wrote in an Oct. 10 email that the work on the Northwest Quad is a two-phase project. The first was the economic and market analysis, which included the Lambert Advisory report. The expense of that phase was $33,695, Grant added. The second phase will entail the necessary amendment to the Fruitville CAP and the rezoning, she continued, at a cost of $25,345. During a Nov. 28, 2017 budget workshop, Commissioner Maio won his colleagues’ support for the hiring of a consultant to consider the highest return on the Northwest Quad that the county could gain through the rezoning of the property. Lambert Advisory won the contract through a county-advertised Request for Proposals process, Maio pointed out on Oct. 10. 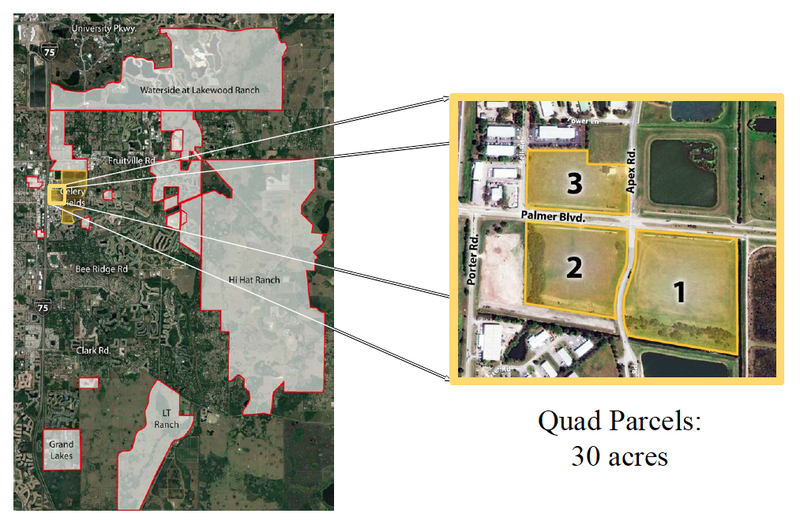 The commissioners concurred this week that they want any potential future buyer of the 7 acres available on the Northwest Quad to be certain of the zoning restrictions. As Liff of Lambert Advisory explained on Oct. 10, the firm undertook a detailed analysis of surrounding uses in the area and market needs. Lambert Advisory put the value of the Northwest Quad at $375,000 if it were to be used for a residential project; for office space, the value would be $150,000. The report said the Northwest Quad appears to be able to support between 75,000 and 80,000 square feet of industrial development. “At this time, industrial development is the most compatible use relative to surrounding development,” the report adds. Hines also told his colleagues he was open to the idea of workforce housing on the Southwest and Southeast Quads. “There’s a significant amount of jobs in this area,” Hines pointed out. Additionally, “You have a massive park that’s right there,” he continued, referring to the Celery Fields. Hines then talked about the months-long effort of a group representing 50 homeowner associations in the area — the Fresh Start Initiative — which had worked at the board’s direction to come up with ideas for the Southwest and Southeast Quads. The group last appeared before the board on Sept. 12, when it urged the commissioners to consider the needs of the residents in the area and the growing reputation of the Celery Fields. 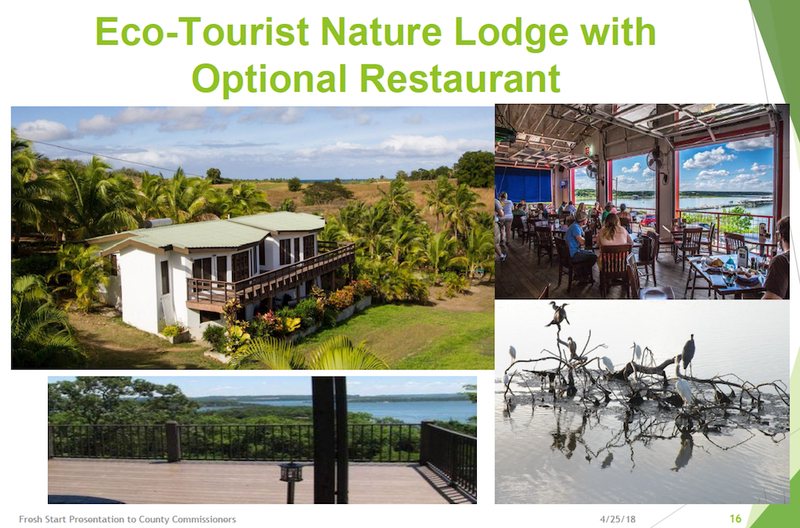 It has proposed recreational uses and perhaps a community center or ecotourism lodge on those other two parcels. “One thing I liked a lot [in the September Fresh Start presentation],” Hines said, was the potential of creative improvements to the Interstate-75 underpass to provide connectivity to Palmer Boulevard and the Celery Fields. A multi-family development on the Northwest Quad could take advantage of the walking and bicycling options, he added. Another idea, Detert proposed, would be a combination commercial/residential development with amenities similar to those at Topgolf Tampa. That company’s website touts more than 100 “climate-controlled hitting bays,” a full-service restaurant and bars, private event spaces; a rooftop terrace with a fire pit; and more than 200 high-definition TVs. 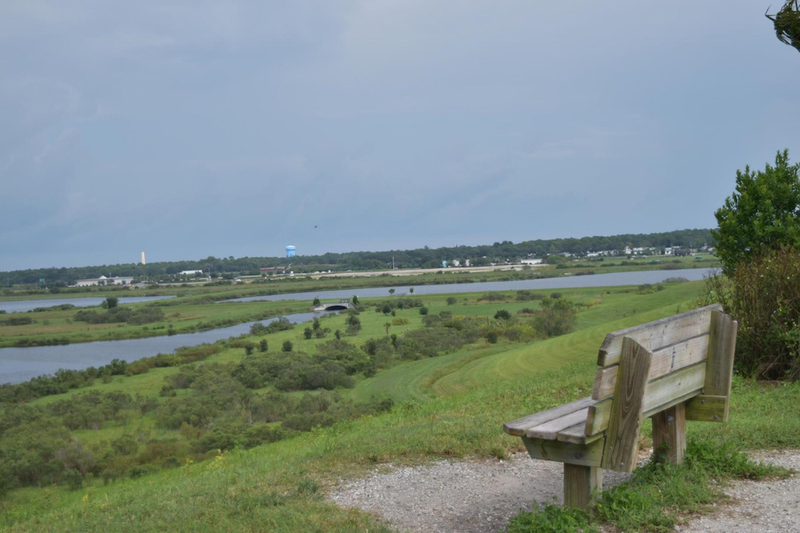 “We should actually take advantage of the fact that the Celery Fields are there and continue along that recreational avenue,” she pointed out. When the commissioners asked about the uses available on the Northwest Quad now, Zoning Administrator Donna Thompson explained that the property is zoned Open Use Rural, which is devoted largely to agricultural uses. Through the special exception approval process, Thompson said, other uses could include a daycare center and a church, for examples. Michele Norton, manager of the county’s Planning and Zoning Division, explained that any rezoning of the property would necessitate “reopening” the Fruitville CAP. “I would be fine with having this rezoned to ILW,” Hines said. Multi-family housing and restaurants are among the uses allowed in such districts, he pointed out. 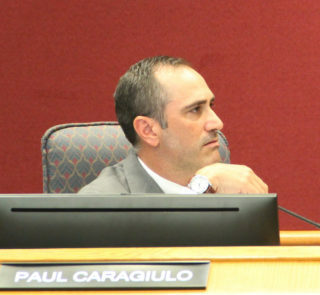 “I’m just not in any big rush to do anything here,” Commissioner Caragiulo told his colleagues. Therefore, he continued, he felt an analysis through the CAP process would be appropriate. The traffic issues have to be addressed, Caragiulo said. “I think that actually facilitates a little better community conversation,” Caragiulo said of utilizing the CAP process.